Reflecting on her first year of blended learning, a veteran teacher saw increased student engagement, accountability, and adaptability. Sometimes in our careers we must take a leap of faith and work outside our comfort zone to make a positive difference. I took such a leap several years ago after 20 years, moving from a traditional teacher-centered class to a more student-centered one. As my teaching style evolved, I adapted to the changes of the 21st century and tapped into the technological world of my students. Although I had incorporated online learning into my curriculum over the years, last year I decided to fully implement a blended learning classroom. I stepped out of my comfort zone again, and was happy to see positive outcomes with my English 12 students. I had a culturally diverse group of students. After assessing at the beginning of year, I found that half could perform on grade level, while the others were still learning English and would not be able to access grade-level material without extensive differentiation. I believed that Catlin Tucker’s blended learning approach would serve them best, so I implemented it with high hopes for me and my students. Looking back, we characterized our year as one of tremendous growth in learning and maturity. Our reflections revealed three important outcomes—increased engagement, accountability, and adaptability—that may inspire teachers across all curriculums and across grade levels to incorporate blended learning into their student-centered classrooms. Getting seniors to enjoy an English class in their last year of high school is always challenging. To help, I used Google Classroom for our virtual learning environment and an engagement model I learned from a Cris Tovani workshop years ago to create the foundation for student choice and student-centered learning. I began classes with mini-lessons on concepts and instructions for work time that students used to complete research, writing assignments, presentations, and discussions on chosen topics. My students worked most of the time in small groups—learning, practicing, and applying knowledge using online apps such as EdPuzzle, Padlet, Newsela, and others. I conferenced one-on-one and moved about the room answering questions and guiding when needed. Overall engagement increased tremendously because my students chose topics that appealed to them and online tools that worked best for them. And when necessary, I gave more direct instruction and guidance in these tools or the course content. At the end of the year, one of my students summed up their engagement: “We were all so productive. Not only that, we had communication like no other class. I am happy I was able to have an experience like this.” I was delighted to see such a positive outcome. Teachers can also foster accountability through blended learning, even in our complicated world where many factors can interfere with students’ ability to account for their learning. Many of my students worked while taking a full course load, and I did not want life to get in the way of them getting the most out of my class. Implementing blended learning gave them more time in class to learn, practice with, and apply our course content. I found my students to be far less stressed and more engaged with their learning while in class, and if they chose, they could extend the learning beyond class time with additional practice I provided online. 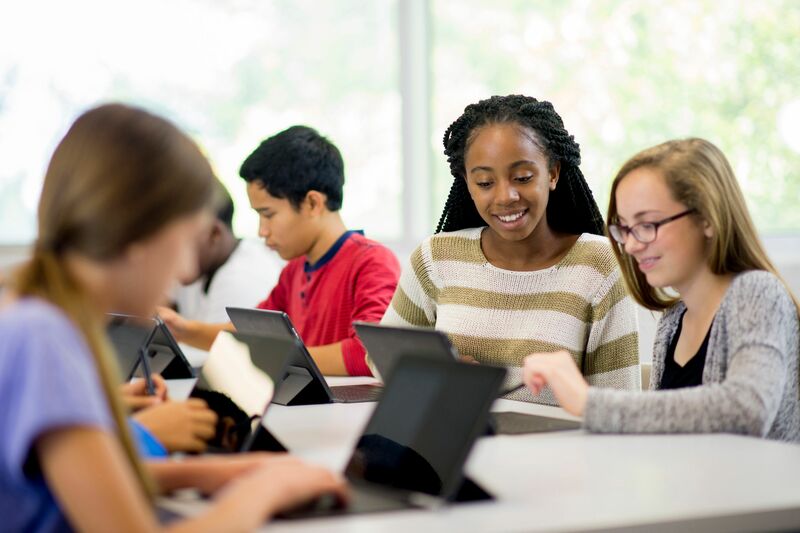 Blended learning also motivated them to stay connected and continue learning even when they did not attend school due to illness, family vacation, or disciplinary action. Some students told me that blended learning created an environment where they had no excuses to avoid completing work even when absent from class. In the learning environment I created, the students chose what they read, researched, wrote, and discussed. They also chose how they presented their work, giving them more control of the pace, place, and path of their learning. It was amazing to see them take charge and enjoy being accountable for their learning. Implementing blended learning creates an environment where adaptability is inevitably necessary to succeed—for both teacher and student. My English 12 course focused a great deal on oral communication, which is one of the state’s standards of learning; however, some of my English language learners had difficulty speaking and writing in English even though they had tested out of the program designed for English for speakers of other languages. To adapt, we used VoiceThread and other voice apps in class that allowed them to practice, receive feedback, and build confidence speaking in English prior to their oral presentations. One of my favorite activities was book talks using VoiceThread—students would record themselves discussing what they were reading and share their talks with the class online. They engaged in meaningful conversations with each other that enabled them to practice with speaking skills. We were prepared for outages involving either the internet or our tools, adapting by discussing and practicing face to face in pairs and small groups. Technology is not perfect, but despite ups and downs, my students and I adapted to blended learning and saw how engaging it was. In a world where we’re always online, adapting to a blended classroom become second nature. When I embarked on this journey with my 12 graders, I thought only about making their English classes meaningful and engaging, but the result—all students reading and writing closer to grade level or above—was better than I anticipated.